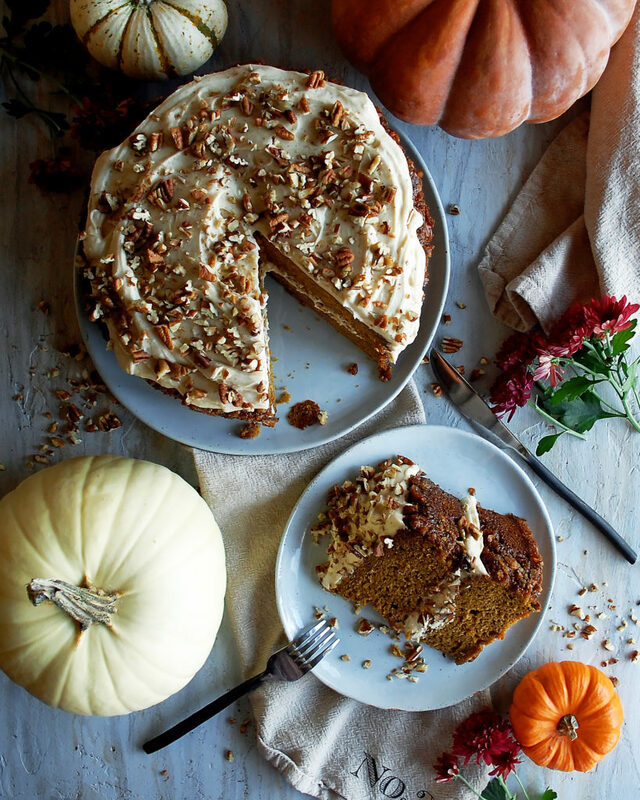 Officially declaring this pumpkin pecan praline cake the cake of the fall season! Alright you guys, so I know I promised a savory, cheesy gnocchi dish today, but when I went to edit the photos, I realized I wasn’t fully satisfied with them. The recipe is so, so good, and the photos just weren’t getting the point across. So, I’m probably going to re-make that dish over the weekend and get it just right! Kind of a pain, especially since I always have such limited time to cook for the blog, but hey, at least I get to eat the gnocchi again! 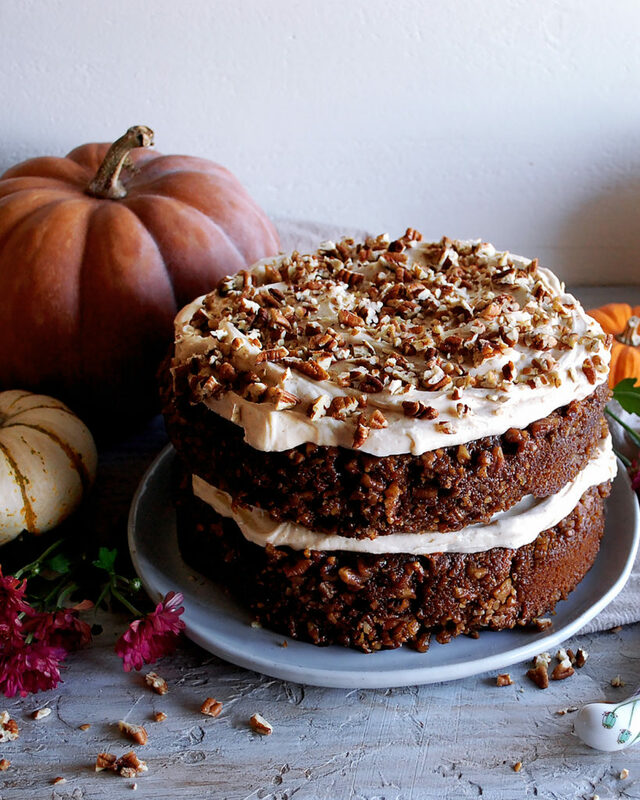 Ok, so moving on to this pumpkin pecan praline cake. 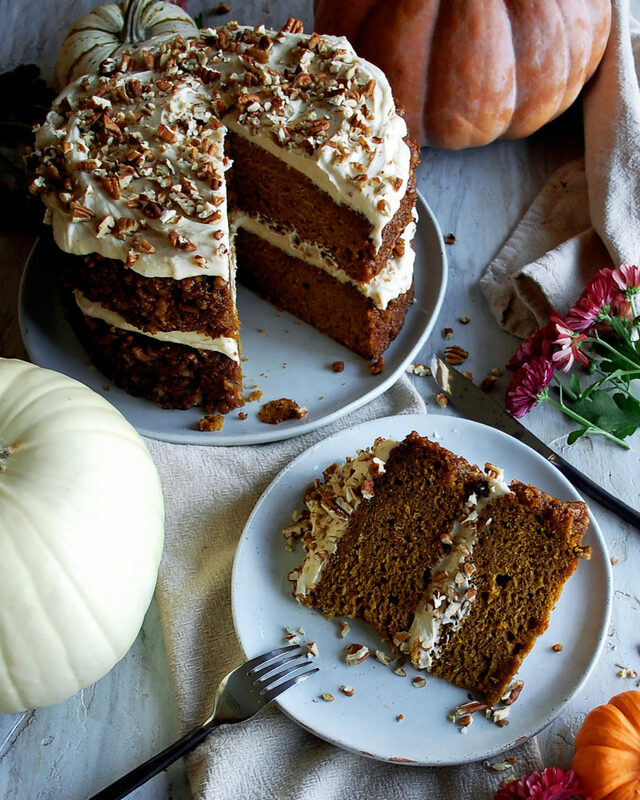 I mean, this is definitely the perfect recipe to substitute on a Friday because it is the perfect weekend baking project! Are you guys into that? 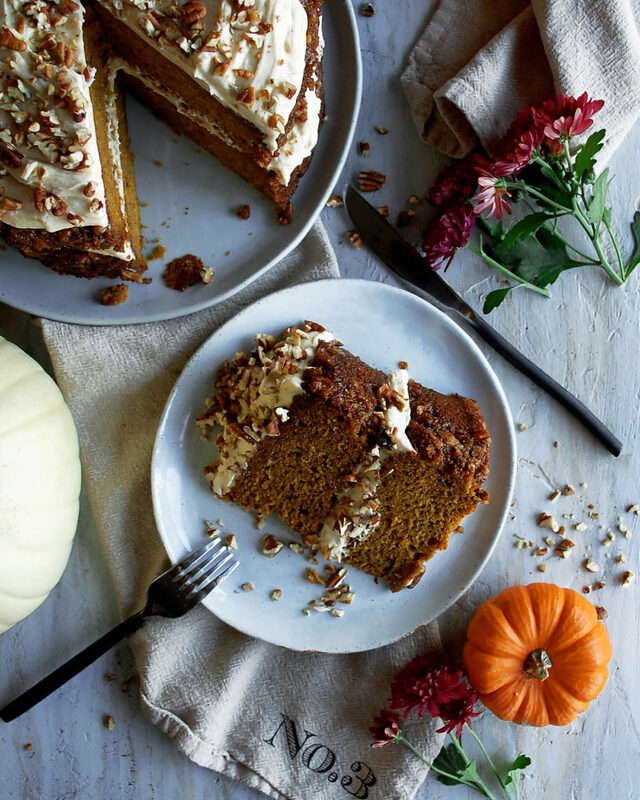 For me, come fall, I couldn’t think of anything better on a crisp night than heating up the oven and baking something delicious. 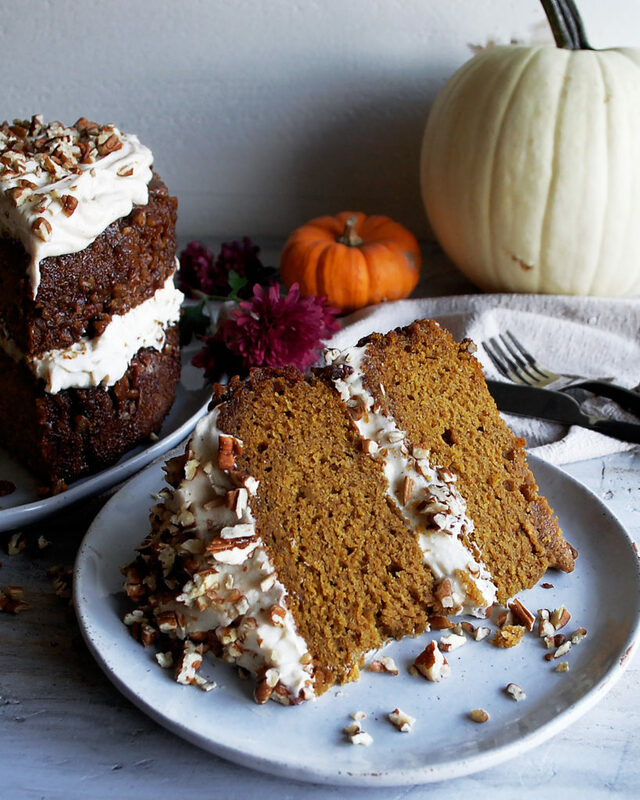 And this cake has all of the fall flavors you could dream of. 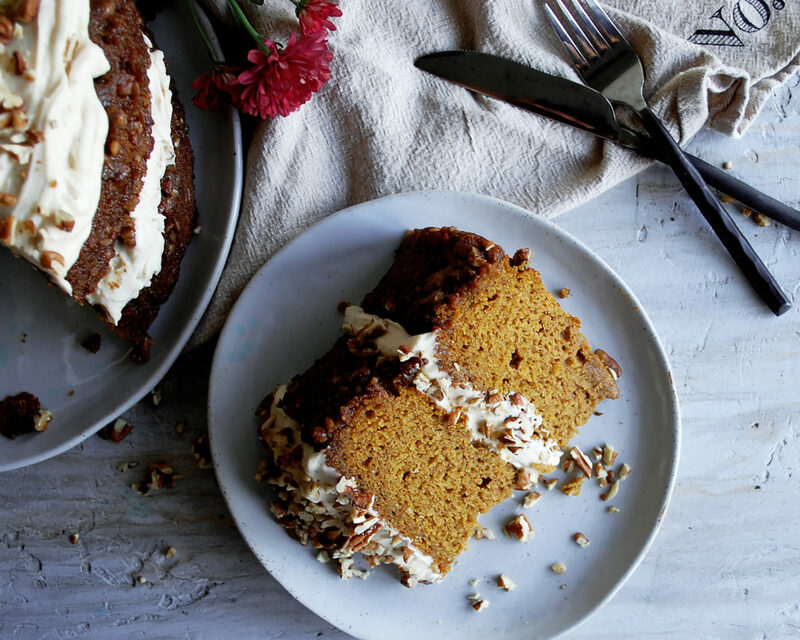 Awhile back in the spring, I made this coconut praline carrot cake. It was based off a chocolate praline cake my grandma would always make my dad…until he developed a chocolate allergy! 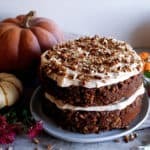 So ever since I have been loving taking that praline concept (because it is so good) and creating different cakes for different seasons. Basically, the cake batter gets made and the praline mixture gets heated in the stove. It’s essentially a sweet, creamy, buttery combination that soaks into the cake and creates a really decadent caramelized edge. YES. So, the praline mixture goes into the cake pan first, then a layer of toasted pecans, then the pumpkin cake batter. I can’t really think of a better dessert for this time of year! I then make a spiced bourbon cream cheese frosting…creamy, full of cinnamon, cloves, and nutmeg, and spiked with a touch of reduced bourbon to give it a little kick. Preheat the oven to 350°F. Grease two, 9” cake pans with butter. In a large bowl, whisk together the flour, baking powder, baking soda, salt, cinnamon, cloves, and nutmeg. Set aside. In another large bowl, beat the eggs. Gradually add both the brown sugar and granulated sugar, continually whisking until the mixture is thick and pale yellow. Whisk in the oil, pumpkin puree, and vanilla extract until fully incorporated. Slowly add the dry ingredients to the pumpkin mixture, whisking until smooth. Set aside. In a small saucepan, combine the butter, whole milk, and brown sugar over medium heat. Let the butter melt and the mixture come to a boil. Whisk so that you get a smooth, thick mixture. Evenly distribute the praline mixture into the cake pans from above. Do the same for the pecans, making sure the praline mixture is completely covered. Pour the batter into the cake pans, filling each one evenly. Use a rubber spatula to smooth out the batter. Bake for 30 minutes. Lower the heat to 300°F and bake for 10 minutes longer. Insert a toothpick to make sure the cake is done (the toothpick should come out clean). Let the cakes cool in the pans for 10 minutes. Run a butter knife along the edges of each pan to ensure the cakes come out cleanly. Starting with one of the cakes, place a cutting board on top of the pan (make sure the cutting board covers the entire pan with a little wiggle room). Hold the cutting board tightly to the pan and flip the pan over so that the cake comes out onto the cutting board, praline side up. Repeat with all the pans. Let the cakes completely cool on a wire rack. While the cakes cool, pour the bourbon into a small sauce pan. Bring the liquid to a bubble over medium-high heat. Reduce the heat to medium-low, and simmer the bourbon until it reduces and becomes syrupy. You want to reduce the bourbon until you’re left with two tablespoons. Transfer the reduce bourbon to a small bowl and let cool. Combine the softened cream cheese and butter in a stand mixer. Using a paddle attachment, beat until smooth, scraping down the sides as you go. Add the sifted powdered sugar in 3 batches, gradually mixing it in. Lastly, add the reduced bourbon, vanilla, cinnamon, cloves, nutmeg, and salt. Frost each cake individually using a spatula and a generous amount of cream cheese frosting. Carefully place one layer on top of the other. Garnish with extra toasted pecans. Slice the cake very carefully. 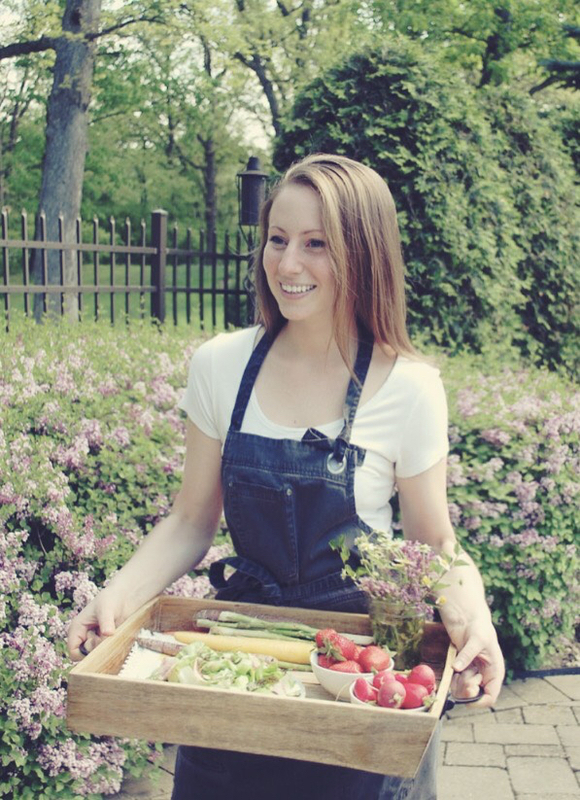 Serve chilled, room temperature, or heated for 20 seconds in the microwave. That is one flavorful most cake. Looks stunning and so tempting. Oh, thank you so much! It really is amazing. I have a carrot version posted, too, which I love to make in the spring!